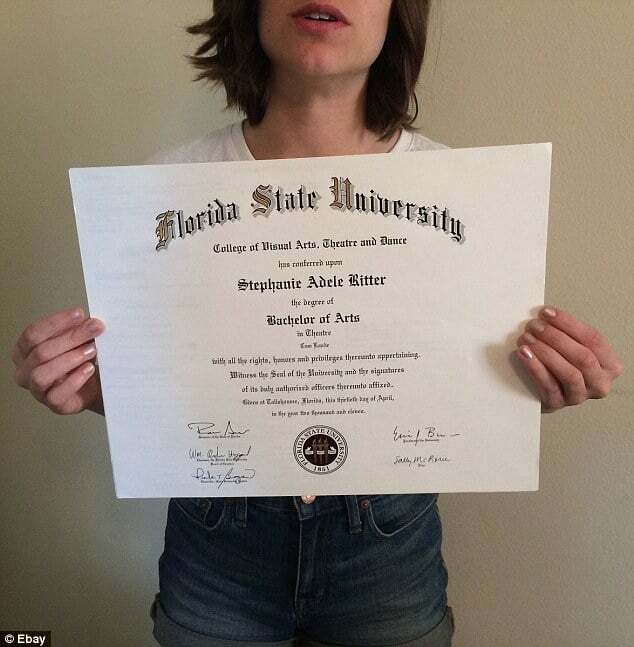 Why your college diploma is probably useless explained by Stephanie Ritter (pictured via Ebay). 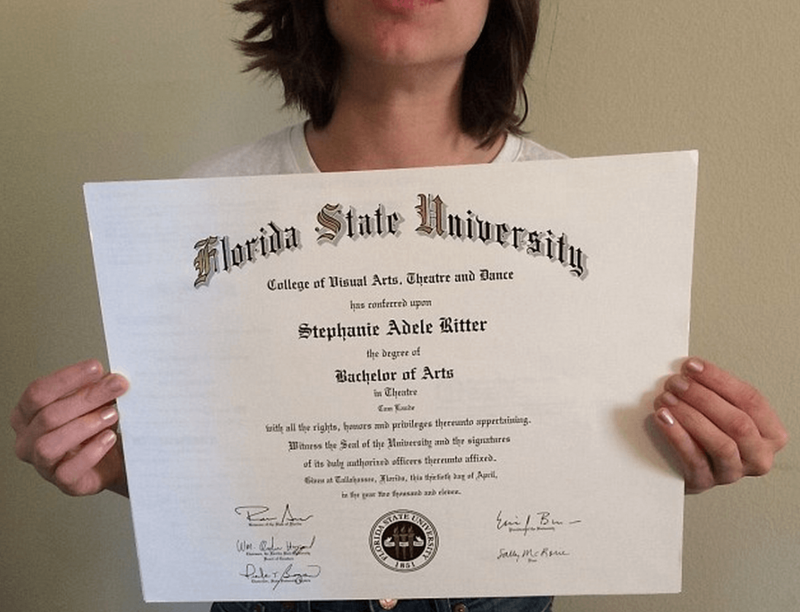 Stephanie Adele Ritter a 26 year old college graduate has offered to sell her Bachelor of Arts college diploma for $50 000 after failing to find a job, four years after graduating from Florida State University. In her listing on Ebay the unemployed graduate told of her frustration of not being able to secure employment and her desire to recoup the cost of her diploma- $50K. A sum which the woman included as the ‘actual cost’ of having attended the school. $40,000 in debt and living in Southern California, and unable to secure vocation in her field, despite having a Bachelor’s degree – the woman described how she was compelled to find a ‘drastic solution‘ to pay off her loans and ‘validate my use of time between 2007-2011’. 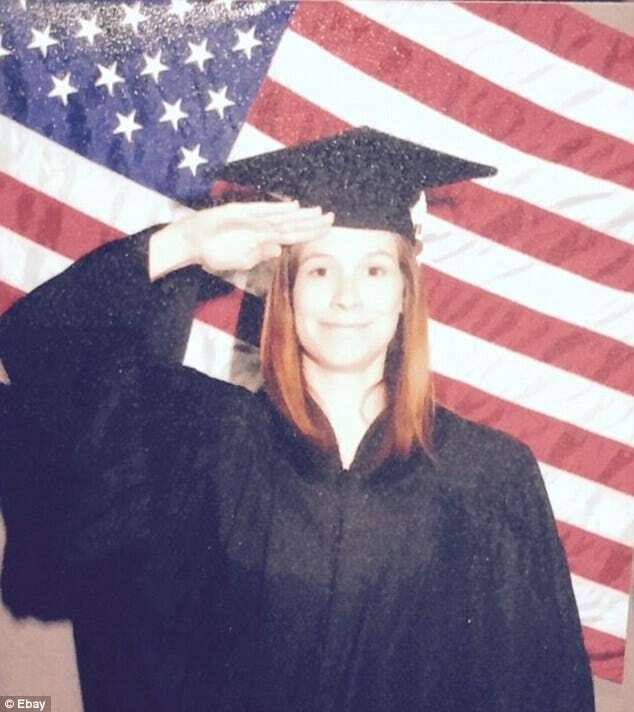 Having majored in theatre and graduated from the public school in 2011 with honors and unable, Ritter tells how she was forced to find a job as an assistant. A job that falls far short of meeting her financial obligations. In a bid to recoup lost funds, Stephanie has resorted to offering off her degree for $50,000 – or the best offer she can get. That $50,000, she explains, will cover not just tuition, but also room and board, books, and ‘memories’. 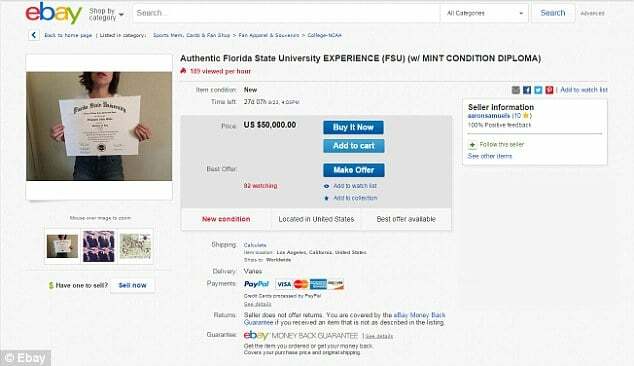 On her eBay listing, Ritter writes that what she is really selling is her ‘authentic’ FSU ‘experience’, and the diploma is just paper proof – seemingly poking fun at the idea that some incoming freshman hold that it’s worth it to take out loans to pay for a particular school because they can’t get the same ‘experience’ anywhere else. In addition to mailing the diploma – for free, lest one be deterred by shipping charges (indeed)- the graduate promises to also give the purchaser a tour of the university, ‘including everywhere you would have gone/eaten/partied in your four years at FSU’. The Ebay listing goes on to note some of her own favorite restaurants and bars in the area. The offer (are you itching to buy your own broken American dream kids?) writes Ritter also provide ‘access to all of my college memories/Facebook albums for six months’ and entry to a show at the FSU School of Theatre (tickets for which can cost $17-50), as well as various tours – including ‘a very quick drive by my former drug dealer/yoga teacher’s house’ and ‘the spots I got speeding tickets in between classes’. Ritter even lists several of the classes she took that ‘led to her diploma’ but didn’t seem to actually provide any marketable skills that set her apart from other people in her field. Some of those classes included engineering, finance, computer science, physics, maths, Play Analysis (in which she studied ‘a bunch of plays I haven’t read or heard of since 2011), Set Design (‘where I painted a 3×3 wooden block’), and Playwriting. All viable subject courses one could reasonably hope to use in order to secure a lucrative career. Or at the very least a first hand understanding of the real cultural drama of the world. ‘Why waste four years of your life going to a state school for a piece of paper when you can just buy mine?’ entices Ritter, listing several ways the buyer could use the diploma – none of which are ‘to get a job’. 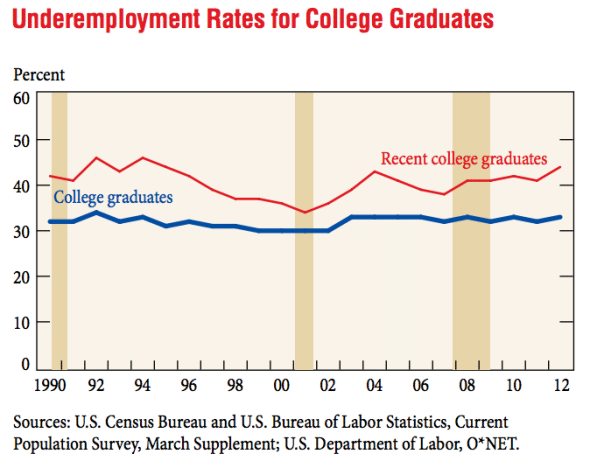 According to the Economic Policy Institute and Slate, 8.5 per cent of college graduates aged 21 to 24 were unemployed between April 2013 and March 2014. 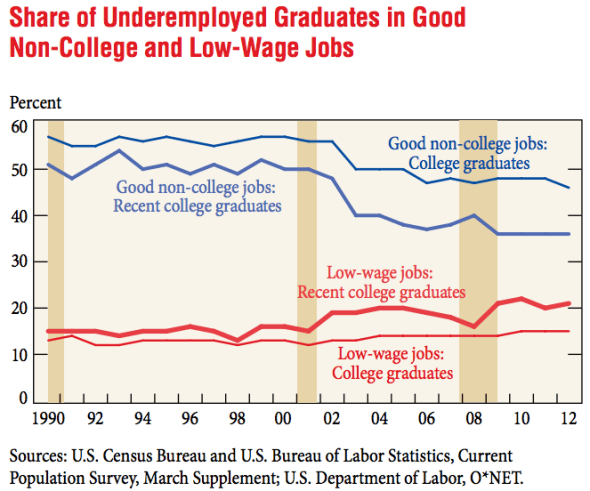 And even those who are employed often aren’t seeing their degrees put to good use. The Federal Reserve Bank of New York has reported that just 27 per cent have jobs related to their major. While Ritter isn’t holding out for someone to buy her degree of her (are you getting your bid ready kids? ), she does concede that she has a back-up plan. ‘If that falls through, honestly, [I will] just do that thing where I pay the minimum for 25 years and then the government feels so bad for you that they wipe it clean,’ she said. What A Joke! She got a bachelors degree in Theatre!?? What did she expect to happen when she got the most useless degree on earth? Did she expect companies from all over the world to chase you down to hire her? Hilarious.. One thing is certain.. If a person gets a degree in theatre and is too stupid to understand why no one will hire them.. then they deserved it. I wouldn’t pay $1 for that degree.